Amie Elizabeth Parry. Interventions into Modernist Cultures: Poetry from Beyond the Empty Screen. Durham: Duke University Press, 2007. xii + 243 pp. Jiayan Mi. Self-fashioning and Reflexive Modernity in Modern Chinese Poetry, 1919-1949. Albany, NY: Edwin Mellen, 2004. 278 pp. This is a review of two works, Self-Fashioning and Reflexive Modernity in Modern Chinese Poetry, 1919-1949 by Mi Jiayan (Edwin Mellen, 2004), and Interventions into Modernist Cultures: Poetry from Beyond the Empty Screen by Amie Parry (Duke University Press, 2007). The two are quite different books, but they share important features that make addressing them in tandem a useful exercise. Most salient among these is the fact that, in their examination of modernism in Chinese poetry, both Self-fashioning and Interventions make more use of explicitly theoretical perspectives than is usually seen in book-length studies of modern Chinese poetry. The result in each case is a rich study replete with new insights, though also in each case somewhat overburdened by the sheer volume of perspectives. This review focuses, therefore, on their respective use of critical models, notably concerning their ideas of the literary fragment and the ways in their authors elucidate the literature in question, as well as and more broadly, their implications for alternative modes of analysis of modern Chinese poetry. The differences between Parry’s and Mi’s texts bear pointing out at the outset. First and foremost, Parry’s work is not just about Chinese poetry, whereas Mi’s book is solidly with the sinological camp. Her subject of an “interventionary” poetics addresses the work of U.S. authors Gertrude Stein (1874-1946), Ezra Pound (1885-1972), and Theresa Hak Kyung Cha (1951-1982) as much as it does Taiwan poets Yu Guangzhong [Yu Kwang-chung] (1928-) and Xia Yu [Hsia Yu] (1956-). As a consequence of this rather eclectic assemblage of authors, her work is somewhat difficult to categorize. Parry’s goal is to break new ground, to provide both a study of the authors in question as well as to advance a procedural model for new approaches to modernist and cultural studies. To focus upon Chinese poetry (of any era) as principal territory of exploration is therefore to diminish Parry’s work, as her work addresses not so much modernist literature, but instead the “exclusionary cultural politics of U.S. modernist literature” (p. 2). However, as New Poetry in China can be seen as one clear example of global cultural forces–political and other–the issues she addresses are not limited to the Chinese texts but arguably well demonstrated in those texts as well. Mi Jiayan’s book, by contrast, is an historically, geographically and in some respects a thematically narrow operation–Self-fashioning is an examination of three Chinese poets whose work was essential to the development of what generally goes by name modern Chinese poetry (xinshi). The three are Guo Moruo (1892-1978), Li Jinfa (1900-1976), and Dai Wangshu (1905-1950). Though Mi’s analysis entails a thorough exploration of literature concerning modernity, with concepts of self-hood and the body the principal focus, he never , ultimately, strays far from the home of these three lyric poets and the terra firma of the canon of modern Chinese poetry. At the same time, though, Mi touches upon a vast array of historical, philosophical and literary-critical perspectives as he examines the poets and poetry in question. His work is almost encyclopedic in nature, providing a review of the intellectual historical context that underlies the entire May Fourth project as well as a tour of much of the critical apparatus that has been employed by late-twentieth century scholarship to examine literary texts produced in that context. Despite the wide array of perspectives marshaled in the service of understanding Chinese modernity, the core of Mi’s text is the very specific locus of the human body, or, in Mi’s words: “self-fashioning through heterogeneous modes of bodily energy in the discursive formation of modern Chinese poetry at shifting historical stages between the 1920s and the 1940s” (p. 1). This, as it turns out, is the first sentence of Mi’s text, and the novelty of his approach to modern Chinese poetry is compelling from the outset. The overwrought quality of the work, meanwhile, is due in large part to the sheer volume of material which Mi covers in the course of his discussion. Despite this excess of information, the body focus and three-part structure provide an elegant and highly satisfying framework for his analysis. As a summary view (which such formal clarity encourages), Mi’s book amounts to something like the following proposition: thesis: Guo Moruo begins the “self-fashioning” process with a naive, explosive libidinal energy that runs ultimately into fundamental “fatal” conflict with national imperatives; the anti-thesis: Li Jinfa relocates the same energy in a decaying body, turning all metaphors of modernity, enlightenment, and progress into death, despair, and decay; synthesis: Dai Wangshu transmutes contradictory imperatives of modernity (principally conceived as contending imperatives of self and nation) into a quotidian and artfully conceived self-expression. Here Mi’s use of critical perspectives is less discriminating. Scholarship of nationalism has long since established the “imagined community” as a coercive force, making the self-sacrifice of the newly fashioned individual to the project of state-building the only possibility. Mi’s analysis of the poetry on this level amounts largely to the observation that Guo’s texts assist in the formation of this particular imagined community (China), which is not exactly news. Mi’s bodily focus catches its stride in the transition from Guo to Li Jinfa, as the “nether regions” indirectly conjured in Guo’s naive and idealistic/nationalistic texts turn downward to “somatic decadence.” Situating Li’s modernity in a decaying body is profoundly correct, allowing Mi to take apart Li’s fragmented texts, at one point literally with regard to human anatomy: feet incapable of walking, paralyzed hands, mouth of “insipid appetite,” leading to an equally “paralyzed” field of vision, a visual rhetoric of persistent darkness, or of seeing the same decayed material universe, natural and man-made, over and over again (pp. 97-100). This is one of the most cogent and yet exhaustive discussions of Li’s highly chaotic, fragmentary texts published in English to date. It accounts for a wider array of his content than most studies, which tend to place too much emphasis on Li’s debt to literary Symbolism and the like. As the chapter on Li Jinfa expands, however, it suffers from a degree of indiscriminate critical analysis that sometimes leads to conclusions that are obvious. In exploration of Li’s bodily decadence, for instance, Mi begins a tour through theories of ennui and modernity–citing Fredric Jameson and Michel Foucault among many others–as evidence ultimately of Li Jinfa’s Baudelarian stand against illumination and enlightenment. That Li’s poetry demonstrates a “rhetoric of counter-enlightenment” and “counter-pastoral” and in so doing is in line with Baudelaire, does not tell us much about his work. The fact that Li’s poetics is singularly bleak compared to that of Guo Moruo is not itself as interesting as how and why this was so. This question, continuing the catalogue of modern criticism, Mi takes up with reference to Derrida’s foundational essay from Of Grammatology. Yet Mi’s text obscures the fact that Derrida’s discussion concerns language itself, its representational capacity, or lack thereof. Derrida’s far-reaching exploration of Saussure’s analysis leads in directions that effectively undermine not only modernity, but writing itself, and Mi’s mention of these perspectives serves more to weaken rather than to bolster important aspects of his argument. Namely, a focus on representational dimensions of the written word would greatly benefit Mi’s reading of Li Jinfa, whose representational crisis is only partly accountable in terms of a critique of a logocentric tradition upon which enlightenment modernity is based. Li Jinfa clearly inherits a (Baudelarian) aesthetic born within that Western tradition, but the fact that he writes in Chinese, that he endures the violence of linguistic “translation,” that he presides over (or actually even authors) a violent dismantling of poetic form and the emergence of a radically new “free verse,” extends far beyond his deployment of somatic imagery and themes. When Mi turns to Dai Wangshu, his text increasingly addresses the subject of fragmentarity, particularly as it is described in one of his major source texts, David Frisby’s Fragments of Modernity. Mi reads Dai’s poetry, with its focus on “routinized objects in family life” (p. 157) and other fragments, as a decisive shift away from the optimistic grandiosity of Guo Moruo and correspondingly “negative ethics” of Li Jinfa, such that we observe “a fundamental shift from macro- and grand historical concerns to micro-and small, everyday historicity, from the higher to the lower and from the external, concrete experience (Erfahrung) to the individual, lived inner experience (Erlebnisse)” (p. 159). Once this shift is made, though, a question confronts us: what, poetically, do we do with the fragments of quotidian experience. Mi’s analysis then engages at some length with Dai’s use of memory, principally as a means of framing his exilic experience, and, finally, provides an extended analysis of Dai’s flower imagery. All of Mi’s work, as Michelle Yeh observes in her foreword to the text, is uncommonly well-grounded in Western philosophy and aesthetic history, and the catalogue of perspectives yields subtle and often persuasive insight into the poetry. The indiscriminant quality to the catalogue of theories–such that salience of any given view is lost in the shuffle–attenuates the overall impact. It may also be worth noting, though, that this quality of Mi’s text is somehow appropriate to his subject; the work reads much like May Fourth Modernity in Chinese Poetry itself, laboring under the weight of too many influences, searching in vain for its own voice. This meta-level aspect of Mi’s book notwithstanding, perhaps the most striking aspect of Self-fashioning is the fact that Mi approaches this poetry as though the Chinese poet writing himself into a modern textual experience is the same as Baudelaire, Dowson, Verlaine, or any other, as though the act of translatedness from French Symbolists to Eliot and Pound is no different than that from the same to Li Jinfa. This, by way of understatement, may be skewing the mater a bit: Dai Wangshu’s transition toward a more quotidian poetics is highly relevant in the context of modern Chinese poetic history and less so in a global context. Nonetheless, Heideggerian observations on memory (and poetry) are not, after all, culture specific, and it makes sense that a great deal of Mi’s work is about poetics, human, and global issues, things that are not confined to the parameters of Chinese culture. Another way to put this would be that, for better and for worse, Mi explores “self-fashioning” in modern poetry generally, using thorough analysis of three Chinese poets as his case studies. Amie Parry’s Interventions into Modernist Cultures: Poetry from Beyond the Empty Screen is, as mentioned, not about Chinese poets per se. In fact, its not so much about poetry as it is about the context for poetry, both as it is created and as it is read. Parry’s book therefore targets “modernism” as a subject, but not “as a literary movement in and of itself” (p. 2). Her choice of only Taiwan and U.S writers is a deliberate attempt to move the conversation about modernism away from Britain, with its own cultural history and, more important, exercise of colonial power, to the United States (and its neocolonial associate, Taiwan), where new insights can be brought to old questions. 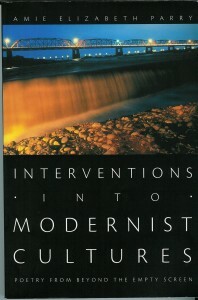 Modernism, in Parry’s book, is both a marker of an interventionary poetics and an example of cultural politics, another species of “neocolonial knowledge formation” (p. 150) that must be interrogated both historically–a feature common to most cultural studies–and poetically, accounting for modernism’s formal properties as both a challenge to orthodoxies and as an instance of modernism’s own coercive universalism. In other words (and Parry’s text puts the matter in a truly wide variety of terms), a modernist text can perform either “canonical” or “minor” functions, attacking colonial epistemologies, on the one hand, but also advancing its own authority, one predicated on the primary interventionary strategy in opposition to regimes of progress-oriented (colonial) power systems, on the other. This is a lot to accomplish, and on some levels Parry’s book winds up like Mi Jiayan’s, with its catalogue-like tendency to index such a wide array of theoretical literature concerning modernity and post-coloniality that wading through them is a bit of a struggle. As we do so, certain questions remain. For instance, why these particular writers? This is not to say that this question, and many others, are not answered in the course of the text, only that finding the answers requires considerable labor and sometimes the result is less than satisfactory. But this is not altogether a criticism: Parry’s work is deliberately subtle and complex, as it endeavors to complicate the literary texts it examines with the ancillary (albeit unstated) goal of allowing readers to appreciate just how complicated the works really are or, conversely, how much standard criticism diminishes the inherent complexity of both canonical (Pound, Stein) and minor (Cha, Hsia) modernist writing in a domesticating maneuver. These very attributes also make Parry’s work challenging to review, as evaluation of many parts of the text involves multiple layers of references to other literatures, many of which have not yet been explored in conjunction with one another. In other words, what does Ezra Pound have to do with Theresa Hak Kyung Cha, or Gertrude Stein with Yu Guangzhong? The circumstances of their writing, their styles as writers, their audiences, all of these are so various as to make yoking them together seem a bit of a stretch. The stretch, again, is Parry’s goal; she wants her book to serve as a kind of bridge-builder between post-colonialist/cultural criticism and modernist studies. In her engagement with the texts themselves, however, she is often very specific and moves deeply into her subject matter. Predictably, the deeper level of her critical engagement arises from the formal dimensions of the literature she engages. In a way that bears striking similarity to Mi Jiayan’s otherwise quite different text, the most salient formal observation concerns the modernist fragment. The fragment, in Parry’s analysis, is born of a crisis in colonial structures. In general terms, she relies on major figures of the critical establishment (e.g., Fredric Jameson and Edward Said) to arrive at an understanding of the “modernist representational crisis” brought about by “necessarily incomplete imperialist structures of knowledge” (p. 3), or, more simply, the collapse of “triumphalist” imperialism (p. 4). More subtle still, though, is Parry’s careful analysis of Taiwan and its relationship with the United States, a breed of colonialism that is less overt and therefore even more “unknowable,” a form of suppressed knowledge that nonetheless becomes legible in the fragments of “layered historical erasures and disavowals” (p. 26). By taking the growing influence of the United States as the larger context, Parry aims to establish a new overall context for Taiwan modernism, one that foregrounds minor modernism as a primary “interventionary” strategy that can subvert universalist histories wherever they may manifest themselves. Let me set it down as a matter of record, in case this book lasts fifty years, that men of my generation in the occident have witnessed the belly-flop or collapse of kingdoms and empires, all of them rotten, none of them deserving any pity or two words of regret. Among the putridities it is difficult to make a just estimate. . . . Thus, fragments are transmuted into interventions into imperialist structures of knowledge, serving as a kind of fodder or nutrient for the poet operating in the wake of this aftermath of the epistemic collapse. Yet, writing poetry, for Pound as well as for Hsia Yu or any other poet, is also to some degree a matter of representing fragments in a tenuous totality. As Parry observes: “Literary fragments are, by definition, images taken out of context, their presence evokes the absence of context” (p. 2). But also, following Benjamin, she notes how the “allegorical image” carries with it, or makes present the “violent marks of the past and, thus, breaks the continuity of history.” The dual function of revealing and concealing (elsewhere in the text described as a “reticent” poetics) is a strategy common to modernist expression in both canonical and minor formats. Parry’s discussion s of minor modernisms forms the bulk of her analysis, with long chapters concerning Hsia Yu and Theresa Kak Kyung Cha, two writers who, in different ways, rework postcolonial circumstances into fragmentary difficulty to express ever more layers of heterogeneity and hybridity. 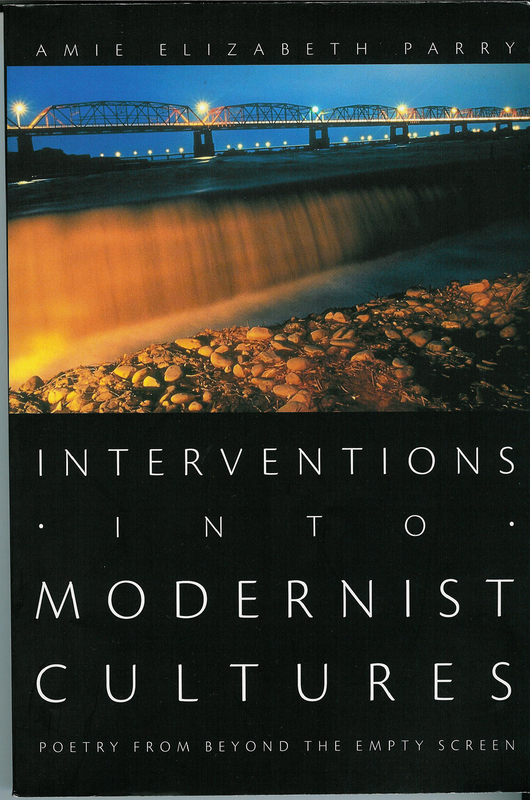 With regard to Cha’s work in particular, Parry introduces the idea of translation as a final mode of intervention, a mode of “counterscript that not only resists developmental narratives but also exceeds a nondevelopmental, modernist empty present” (p. 118). Itself a kind of fragment, translation ultimately serves as a mode of challenging universalism in the process of pursuing is a “counterhegemonic historiographic project” (p. 131). Ultimately I find some of the critical-theoretical parsing of Parry’s texts to be unnecessary, and a considerable amount of the prose to be unnecessarily convoluted. The issues are complex and subtle, but the writing is overburdened with critical perspectives that purport to express conflicting views but that, on second consideration, actually are in accord with one another. Minor literature’s critique of post-colonial-power-affiliated narratives shares more with early modernist objections to Empire than it diverges from them. And though the problem of an aesthetic universalism manifesting itself in modernist form (the fragment) may be a concern for many authors of minor literature, the ability of writers the world over to tear down hegemonic structures seems well intact. Parry’s goal in this discussion of seeking out a new mode of comparative poetics, one which takes stock of minor literature in all its subversive power, is entirely accomplished. That said, and at the risk of tossing yet another critic onto what is already a book over-burdened with critics, I believe much of what Parry examines in terms of fragmentarity as it relates to modernist method is described by George Steiner, whose essay “On Difficulty” (1972) describes “Ontological difficulty”–one of four types–as being a case of “difficulty which implicates the function of language and of the poem as a communicative performance” (On Difficulty, 41). This type of difficulty, for an example of which Steiner uses Wallace Stevens’s “Anecdote of the Jar,” “is a subversion and energizing of rhetoric drawing attention, . . . to the inertias in the common routine of discourse” (ibid, 40). I raise this example in closing only to suggest that there is in fact much to unite the methodologies and accomplishments of the writers treated by Parry despite, and this is an important point, their broadly divergent backgrounds and experience. And there is much in the work of these writers that suggests the ways in which fragmentation as a formal principle can achieve the ends of intervention, upsetting if not utterly destroying a variety of authorities and universalisms. From the writer’s point of view, the end goal may be just as Pound described: “to reveal the subject to the reader” by “presenting one facet and then another until at some point one gets of off the dead and desensitized surface of the reader’s mind, onto a part that will register” (p. 119). Parry’s book, for its considerable insight, registers well indeed. To the extent that both works concern modern Chinese poetry, I see each as an important step in opening up the field to a greater variety of perspectives. More than the discovery of new knowledge and expansion of methodology, though, the marginality of modern Chinese poetry itself–a symptom of small readership and relative critical neglect–more or less evaporates in Mi and Parry’s works. Modern Chinese poetry shows itself, as a focus of critical analysis, as capable of yielding as rich insight into Chinese modernity, post-coloniality, cultural and global discourse as any filmic or fictional text (to name a few of the more studied genres). And though the two books are notably different, not least in the sense that Parry’s parameters are geographically, linguistically, and historically borader than Mi’s, they each demonstrate the ways in which lyric poems as artifacts of cultural expression open fascinating windows on human expression. Mi’s text in particular capitalizes on the subjective dimension of lyricism, which in the case of modern poetry nicely parallels the wider and highly fraught process of cultural modernity in China. Parry meanwhile subjects the global dimensions of a modernist project as developed by Pound and others to uncommonly subtle analysis, uncovering layers of textual resonances (and dissonances) across cultures and time frames that would be literally unthinkable were it not for her innovative approach. In sum, these works add a great deal to our current discussion, and are welcome for it. There is of course a substantial literature on modern Chinese poetry, much of it very theoretically informed. One example of a book-length study with even higher concentration of critical perspectives would be Gregory Lee’s Troubadours, Trumpeters, Troubled Makers: Lyricism, Nationalism, and Hybridity in China and Its Others (Duke University Press, 1996). Which Parry rightly observes does not strictly exist as a movement in the United States per se. Frisby’s work is more than merely content for Mi, as the three-part structure focusing on three major figures is precisely the format of Mi’s book. In this particular example we find that each text is chosen “because it can be read as in some way reacting critically toward its own time and as engaging with its time in a dynamic way”(148)–of which the same can be said about a good deal of literary writing. The major figure in Parry’s work for historical perspectives on East Asia and post-colonialism is actually Bruce Cuming’s work Parallax Visions.